Winners of the 2018 Firefighters for a Day Contest - An exciting experience for four young Rosemerites! 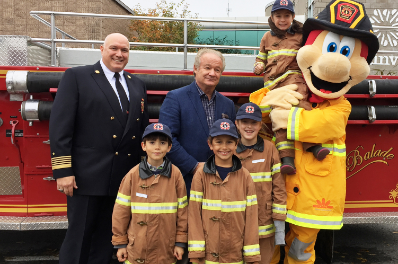 ROSEMÈRE, October 11, 2018 – On October 10, four grade 3 students from the Town of Rosemère experienced an extraordinary day at the fire station with the Fire Department’s firefighters. Dressed as firefighters, they got to take part in a host of activities, touring fire trucks, attending training sessions, searching for a victim, putting out a fire, running an obstacle course, etc. Organized in collaboration with the Town of Blainville, Firefighters for a Day is an annual event involving grade 3 elementary school students selected based on a drawing contest. This year, Rosemère’s four winners were: Arthur Pouliot (Alpha School), Louis-Gabriel Guillén Mayers (Académie Ste-Thérèse), Ariane Collin (Val-des-Ormes School) and Florence Joly (McCaig School). Bringing the day to a close was the signing of the Town of Rosemère’s Golden Book in the presence of Rosemère mayor Eric Westram, along with the president of the Security Commission of the Town of Blainville Guy Frigon, Fire Department Director Claude Deschuymer, and mascot Yvon Larosé. “This event, which was organized within the framework of Fire Prevention Week, allows our young people to deepen their knowledge of fire prevention while having fun and, for some of them, making a dream come true! The sparkle in their eyes after this exciting day incites us to repeat the event from year to year,” revealed Eric Westram, mayor of Rosemère.